It’s one of the worst-kept not-a-secrets in the world that I keep an account on OK Cupid. Sometimes I even reply to messages on the thing. Since when am I capable of not replying to something like that? Never, is when. I even drew a comic about it once, and since when do I draw comics? Hardly ever, is when. First, for the snark: This is a white dude who would strongly prefer to date within his race and who thinks burning flags should be illegal. There’s not much risk of him ending up in my friend zone, if ya know what I’m sayin’. But I’m feeling pretty generous today. It’s a gorgeous, sunny day. I’m sitting out on my balcony with my plants. I’m feeling happy with myself. It’s the kind of day where I can summon up a bit- just a bit- of empathy even for the overtly racist misogynists among us. I sincerely hope that some day you look back on your current perspective with a wry sense of mortification. I hope that you learn to treat the people you are attracted to with no less consideration for their own agency than your own. I hope that you grow to have full, rich and varied friendships with people of all genders, regardless of whether you’re capable of being attracted to them. And I hope that you learn that no matter how heartbreaking unrequited love is, it’s nothing in comparison to a culture that treats you as worth nothing outside of your appeal to others. 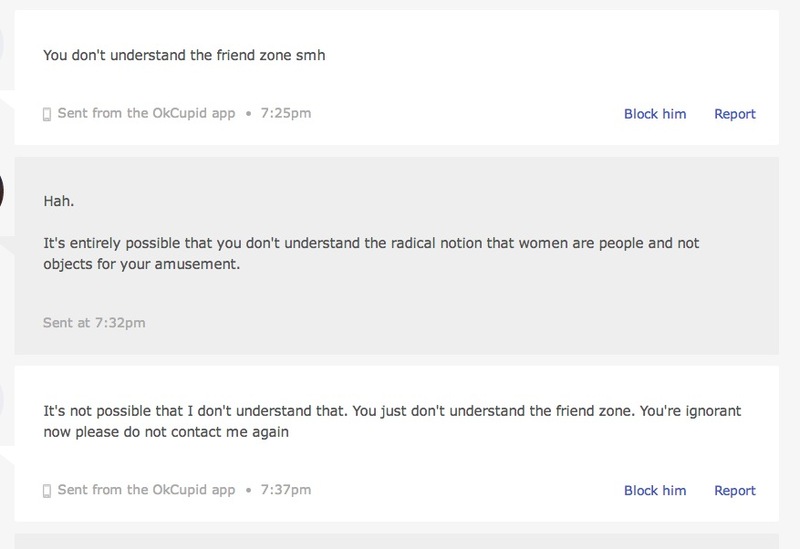 Because what the ‘friendzone’ teaches us is that you don’t see the people you’re attracted to as fully human. You can’t see that they have motivations that have absolutely nothing to do with yours. That your attraction to them- that stomach-churning, gut-wrenching feeling you can’t but have around them- doesn’t oblige others to feel a particular way, or to act in the way that you’d like them. And someday I hope you understand that, right in your guts. I really, really do. In the meantime, though? Get the hell out of my inbox, thanks. *If they are, I’m here all week, and don’t forget the tip jar on the sidebar! Yep, I got a new Toy For Drawing Things With.